Last edited by Dad_Scaper; September 28th, 2017 at 09:34 PM. Hah! That's awesome! Any festivities, or just gathering for a picture? Nice - I wonder how that ended up happening. Can anyone get a list of names from left to right? I don't see @truth , unless that is the fourth from the right. At Origins this past year I had set up Heroscape and a couple came by that said they designed the figure sculpts for wave 4 on, including Aquilla's Alliance, but I forgot their names and they don't look like they are in the picture either. The woman I guess is a prestigious designer for Reaper and other miniature companies now, and they signed my cards so I will have to look when I get home. Truth is in there. Not fourth from the right. That's somebody else. Keep looking. Sir H., it was kind of like a reception. Just hanging out for awhile talking, then a few pictures. Afterward the group went off in a few different directions. There are quite a few people here from the early days of this board. I'll supply some names when I feel like it. Just wanted to let the picture speak for itself first. Thanks for sharing that pic big daddy. This community owes those folks a hearty thanks. Here's a higher res version of the same picture (click to embiggen), numbered to make documenting who is who easier! Let's see how many numbers you all can identify! Hey! Where did you get that???!!! 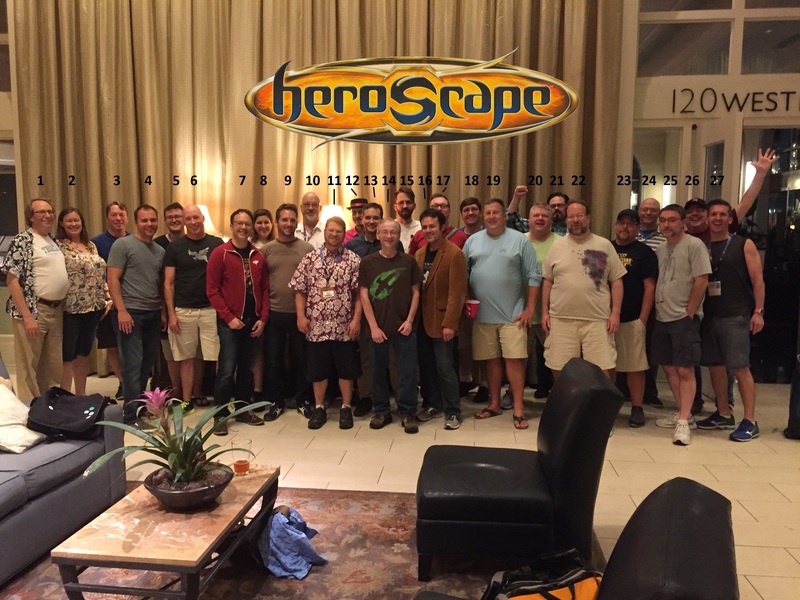 Does the Heroscape logo just appear when they assemble? It wasn't even his phone, though! The Heroscape logo was actually added afterward by Alan Roach, who supervised CVN back in The Day at Hasbro. You can see Alan as #26 in this picture. He's also the designer of Box of Rocks, the fun party/trivia game I've probably played most in the past year. Browsing the ScapeTalk Podcast feed and blog can help identify a few on the people. I can still only identify about 6 or 7 of the 26 people in that pic.